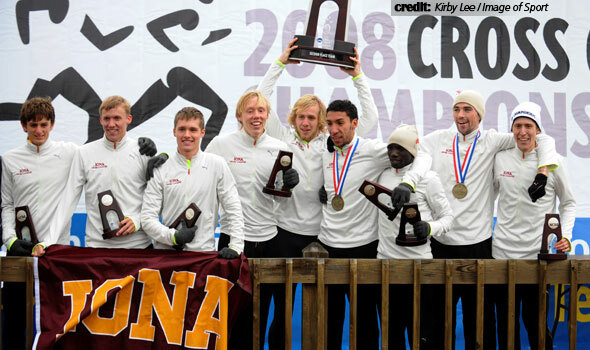 NEW ORLEANS –For the third straight year, the Iona College Gaels are the 2008 NCAA Division I USTFCCCA Men’s Cross Country Scholar Team of the Year, the U.S. Track & Field and Cross Country Coaches Association announced on Thursday. Iona finished 2nd at both the 2007 and 2008 NCAA Division I Cross Country Championships. Iona won their fourth straight Northeast Regional Championship and their 18th straight MAAC title on the way to their 2008 runner-up finish at the NCAA Championships. Iona, which maintains a cumulative 3.050 grade point average, also earned USTFCCCA All-Academic honors in 2005, 2006, and 2007. Vanderbilt University had the highest overall team grade point average (3.755). A record total of 110 Division I men’s programs received the USTFCCCA’s All-Academic Team honors this year compared to 98 schools earning the honor last season. Thirty-five percent of all Division I institutions (315) who sponsor men’s cross country received the honor. In addition, 7 of the top 10 and 14 of the top 20 teams in the championship field at this year’s NCAA Division I Cross Country Championships were named USTFCCCA All-Academic Teams. The Big Ten Conference, Big 12 Conference, Missouri Valley Conference, and the Southeastern Conference tied for the most conference members represented on the list with six teams each. For a team to be considered for the USTFCCCA All-Academic Team award, they must have competed and compiled a team score at an NCAA Regional Meet. The team must also have a minimum 3.00 team cumulative grade point average.